Jamaica’s new Prime Minister, Portia Simpson Miller, has said she intends to make the island a republic, removing Queen Elizabeth as the head of state. 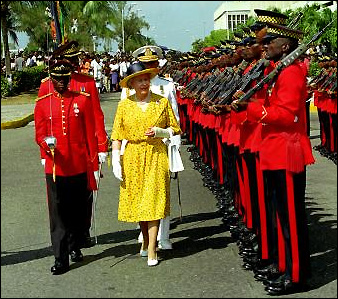 In her inaugural address, Ms Simpson Miller said the time had come for Jamaica to break with the British monarchy and have its own president. The announcement comes ahead of celebrations to mark 50 years of Jamaican independence from Britain. The Queen’s grandson, Prince Harry, is due to the visit the island this year. “I love the Queen, she is a beautiful lady, and apart from being a beautiful lady she is a wise lady and a wonderful lady,” Ms Simpson Miller said after swearing the oath of office. “But I think time come”. “As we celebrate our achievements as an independent nation, we now need to complete the circle of independence,” the prime minister added. In response, a Buckingham Palace spokesman said “the issue of the Jamaican head of state was entirely a matter for the Jamaican government and people”. Ms Simpson Miller, 66, became prime minister for the second time after her People’s National Party won a big election victory on 29 December. Her inaugural address mostly focused on her plans to revive Jamaica’s economy. The Caribbean island has widespread poverty, high unemployment and huge debts. Ms Simpson Miller is not the first Jamaican leader to promise to move towards a republic. In the early 1990s, then-Prime Minister PJ Patterson also said it was time for the island to have its own head of state, and set 2007 as the deadline. Esse post foi publicado em Assuntos Internacionais, Monarquia e marcado Elizabeth II, Jamaica, monarquia, rainha da Jamaica, república por Joanisval. Guardar link permanente. Embora eu não seja monarquista, realmente tenho dúvidas de que a Jamaica possa ganhar virando uma república… Neste caso acho que concordo com você! É mais ou menos como a Martinica estar melhor como departamento “d’outre mer”da França do que se fosse independente. Os martiniquenhos (? ), que eu saiba, gostam muito de ter passaporte europeu!